For the second consecutive week Baxter County is among the state's top 14 counties reporting influenza cases.For the reporting week ending Saturday, Newton County has joined the list reporting the largest number of flu cases.During the flu season, the Arkansas Department of Health produces a Weekly Influenza Report for clinicians. The report provides information on flu activity in the state. The report also compares influenza-like illness in Arkansas to activity in the U.S. ADH receives reports of only a fraction of flu cases. Therefore, department officials note it is important to understand the information in the weekly update is representative of the timing and location of activity, but it does not reflect the overall burden of disease. It is presumed there are many more people actually affected than the report shows. Since Sept. 30th, 2018, over 4,000 positive influenza tests have been reported to the ADH online database by health care providers. Among flu antigen tests that can distinguish between influenza A and B virus types, 79 percent were influenza A, and 21 percent were influenza B. The average school absenteeism rate last week was 6.3 percent among public schools. 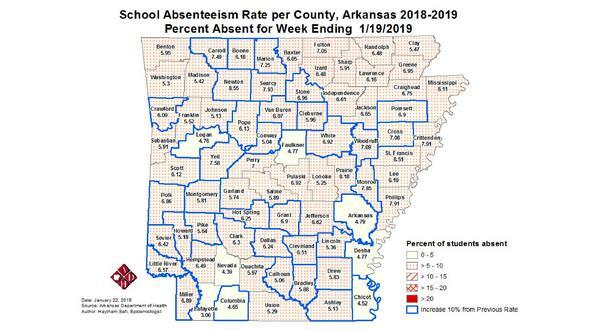 While Baxter County's school absenteeism rate was slightly below the state average at 6.05 percent, every surrounding county was higher. Searcy County was the highest among surrounding counties at 7.93 percent, followed by Marion at 7.25 percent, Fulton at 7.05 percent, Stone at 6.96 percent and Izard at 6.48 percent. To date, 15 influenza-related deaths have been reported in Arkansas this flu season, including one pediatric death.